Favorite Credits: Contributing Writer to The Onion News Network, Winner of iO’s 2015 “Best Scripted Show” Award for Not All Cops Are Bad! Why theater? : I’m searching for connection outside of the internet! Tell us about Not All Cops Are Bad! : I play officer Scott Baker, a cop hosting a town hall meeting to mend public relations after a series of ‘viral videos’ featuring law enforcement surface. Not All Cops Are Bad is a multimedia, audience interactive show that operates like an actual town hall meeting. 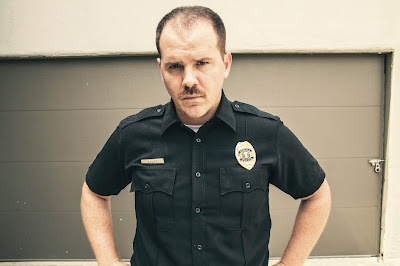 The character attempts to save face and prove that “Not All Cops Are Bad” by detailing his tragic home life, reminding the audience of post 9/11 glory, taking selfies with audience members and rationalizing horrific iphone videos that have gone viral. What inspired you to write Not All Cops Are Bad? : Like many people, I’m trying to come to grips with this ugly time period in American history. I have witnessed racial injustice from growing up in St. Louis and teaching high school on the south side of Chicago. I also have family members in law enforcement. I wanted to try to understand this complicated issue through human beings rather than characatures. So while the show does make fun of a particular cop mentality plaguing law enforcement, I do try to play devil’s advocate, poke back at Facebook heroes and outrage culture in general. What kind of theater speaks to you? What or who inspires you as an artist? : I am inspired by any artists that write with a humane core while challenging themselves to ask tough questions and search the shades of gray. Louis CK, Norm Macdonald, Bruce Springteen. If you could work with anyone you’ve yet to work with, who would it be? : Louis CK. What show have you recommended to your friends? : I have recommended Baskets and Horace and Pete. Two extremely original, funny, compelling and vastly different pieces of work. Who would play you in a movie about yourself and what would it be called? : My friend Wes would play me and it would be called "Unearned Depiction of a Mediocre Life Story". If you could go back in time and see any play or musical you missed, what would it be? : Anything by Shakespeare to see if he was really all he’s cracked up to be. Fiddler on the Roof with Zero Mostel or anything with Gene Wilder. What’s your biggest guilty pleasure? : Listening to Linda Ronstadt records. If you weren’t working in theater, you would be _____? : A high school teacher.